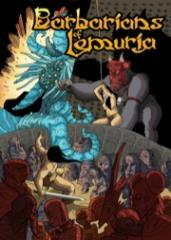 The highly acclaimed sword & sorcery roleplaying game Barbarians of Lemuria, now in an awesome new edition! Inspired by Thongor, Conan, Brak, Elric and other mighty heroes, Barbarians of Lemuria gives you a simple system designed to emulate the genre and not to get in the way of your gaming experience. This new print version updates and expands on the previous rules to make one of the simplest yet most true-to-genre sword & sorcery roleplaying games on the market.